Malady's unique musical offering sounds like a college rock band gone heavy, only to be pulled back by '80s new wave and intellectual post punk. The eight-track self-titled debut by this outfit comprised of former members of Pg. 99 and City of Caterpillar play with the acumen of seasoned pros that know how to maximize the power of a riff and the dynamics of tempo shift. Lush undercurrents of cascading melody pervade "Well Again", while dissonant guitars and herky-jerky rhythms propel "Said Simone". 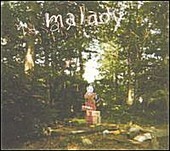 Malady isn't an entirely overpowering band: they're not loud or overly violent but songs like "The World is a A Tomb" remains intense, building up crests and waves a la Fugazi and Jawbreaker. When all cylinders are running, like on the disjointed anthem "Let's Face It", the overwhelming sensation will sweep you away.